Hey, it is Leap Day...whatever. There is no argument there, widescreen is better. If you think otherwise, you are stupid. Plain and simple, you are an idiot. I do not need to go into how one can lose up to 50% of the image. Simple math lesson for you morons out there: Fullscreen is 4:3 ratio, which is 1.33. Widescreen can be up to 2.35, sometimes 2.70 and more. Take 1.33 and 2.70, do a little division and you get close to 50%. There is plenty of proof out there of this. Want more? Look on the back of the Fullscreen DVD you just got. Look for the line that says, "This film has been modified from its original version." Modified??? Also, "It has been modified to fit your TV." Hello? Either get yourself an HDTV or live with the "black bars" on the top and bottom. For those of you who have a 16:9 HDTV and watch fullscreen movies, you not only have to deal with black bars on the sides...you too, are a moron. You will also realize what you have been missing. You are not seeing the film as the makers of the film intended. Speaking of fullscreen DVD's; why are some of them THX certified? Why are they Dolby? Why, I ask, why would it even be in stereo. If you do not want the full visual experience of the movie, why would you want full audio? All fullscreen movies should be in mono! Yeah, it took eleven months to get another shutout. 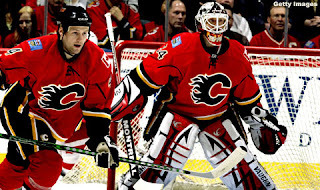 But tonight, Miikka Kiprusoff got his twenty-fifth career shutout, first of the season. 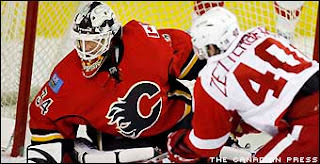 Oh, and he did it against the leauge leading Detroit Red Wings, stopping all 38 shots faced. A 1-0 win thanks to Alex Tanguay's fluke goal from behind the net. Tonight's game also marks the debut of Jim Vandermeer who was acquired Wednesday, from the Philadelphia Flyers, for a third round 2009 draft pick. That is him next to Kipper. Back in August, I took a business trip to Stamford, CT. I could not tell you what is was about, but since the news is out, now I can. We went to Stamford, home of WWE Headquarters, to pitch for the WWE toy license. Long story short, we got the license. Yeah, that is Shane McMahon and Linda McMahon raising our hands in victory. I am, of course, in the Bret "Hitman" Hart t-shirt. I just 'invented' a new word. I did some research and more research, and it looks like I will be getting a Nobel Prize next year. But first the back story of how I came up with the word. As you know I am a huge hockey fan. 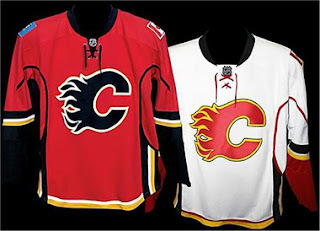 My favourite team is the Calgary Flames. Like most sports entities, a player and/or team have one team that love/hate to play. The fans from both sides love to hate each other. 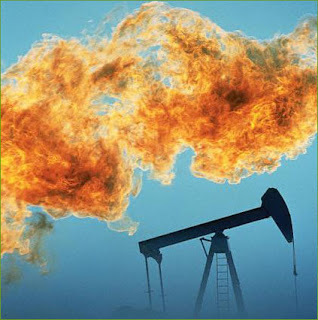 For the Flames, this team is the Edmonton Oilers. This war between Provincial 'rivals' is called the Battle of Alberta. Whenever the Flames and Oilers play, it is not only big news in their respected cities, it makes headlines in Alberta and all over Canada. This rivalry is not just in hockey, it goes for EVERYTHING! 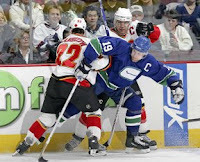 In the past few years, the Flames have also raged war on Division rival, the Vancouver Canucks. 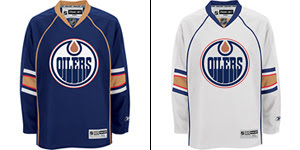 Much like the Battle of Alberta, you can expect big hits, fights, and crazy fans. Oh, and a pretty good hockey game. Though not as chaotic as Edmonton and Calgary, Vancouver and Calgary is pretty exciting. Last night, there was a game with the Oilers in Vancouver. Fights broke out, and it was if the Oilers were playing Calgary. One who attempts to equal or surpass another, while attempting to surpass a third party as well, or who pursues the same object as the other two; a competitor. One that equals or almost equals another and/or a third entity in a particular respect. 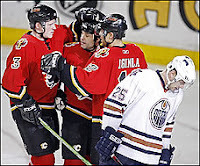 the action, position, or relation of a rival or rivals; competition: trivalry between Calgary, Edmonton and Vancouver. There you have it: trivalries. Use it well, use it often. But remember, you heard it here first...Nobel Prize here I come. UPDATE: I entered the word and definition at urbandictionary.com. Here are the ones I did, you can also see them here on Chris' site. Thanks again to Chris for posting my work. Well, not really me, but my work. 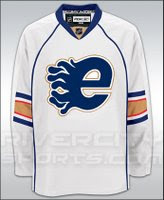 I did this for fun and submitted it to Chris at NHL Tournament of Logos for Freak Out Friday. Go Here. 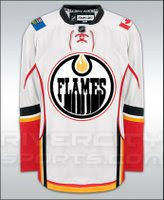 I did the Oiler and Flames logo mash-ups...then put them on jerseys. I am kinda proud to have my 'work' shown to the world. Please leave comments there...'cause I know you are not going to leave any on my site. Special thanks to Chris for posting my work (even though it is not that great). At least people actually goto his site. 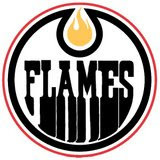 UPDATE: I guess I caused quite a stir, as the logo is featured in the Edmonton Journal. Awesome! The above is a great picture that I jacked from this site. I just thought it was a good photo, that is all. GO FLAMES! We wrote this in response to an unpleasant shore excursion. A few days later, we received 40% refund of the excursion price. I just want to share this with you. Enjoy. I’m sure this is one of many complaints about Platypus, Kangaroos & Koalas – Healsville Sanctuary - ML33 and unfortunately this is not the last as more are sure to come. Let’s start with the check in procedure. There were at least 4 different colored stickers for #33, two of which is lavender and pink, which caused confusion amongst guests as colors were too close in hue. An easy solution would have been to have contrasting colors. Upon leaving the ship, the crew member that guided us to the bus had no clue where to go. We were not properly directed to the appropriate bus. On a side note, holding one plain white sign that just says “Celebrity Cruise” is not enough information for guest to gather together in their respected tours, as we are all from the Celebrity cruise ship. The disorganization is continued as we tried to locate our bus. One attendant informed us to take the bus ahead. As we approached the bus, we were told that our “lavender 33” sticker did not match the color of her group and told us to go to yet another bus. We found that bus was full and were redirected back to the first bus. On the bus, there were multiple color #33 stickers on guests. It is pointless to have separate groups and not have them organized in the same bus. All this confusion and disorganization can be avoided on THIS and ALL other excursion pre-departures. As for this excursion, ML33, there wasn’t time to experience Healesville Sanctuary as advertised in the brochure and in your Excursion Information Channel (Ch 16). It took nearly 2 hours to arrive at our destination, giving us only 55 minutes total to visit the sanctuary. The request to extend our stay was declined by Celebrity even though the bus driver and the tour guide were more than happy to allow us more time. There was not an afternoon tour scheduled at 1pm, therefore, there was no urgent need to have our tour be back at ship by 1pm. We had to rush through Healesville within time permitted, leaving us LITTLE or NO TIME to experience each habitat exhibit. Your brochure uses words like “walk-through” and “stroll”. This was not the case as we were literally “RUNNING” from exhibit to exhibit with our park ranger (David) in order to get back on bus by the expected time. Because we were so rushed through the park, we only saw about half of what the park offered. We learned more about the park through the bus driver (Chris) and tour guide (Pauline) on the long bus ride back to the ship, when we should have been learning from the expert park ranger (David). Again, according to your brochure, the tour is approximately 4 hours. We spent the 4 hours on the bus traveling to and from the park. This reinforces the fact that we had very limited time at the park. Math lesson: two hours to get to sanctuary plus two hours back to the ship…equals four hours! This is ridiculous. And all is due to the poor organization and poor planning on the part of Celebrity Cruises. This being the first time Mercury had docked in New Zealand and Australia is no excuse for poor planning and lack of research as the procedures should apply to any and all destinations. Staff members in their respected post also need to be educated about all the destinations, old or new, in order to help guest answer all their questions and needs rather than a constant answer “I don’t know, this is our first time here, please watch channel 16.” This is also our first time here too, but we are the customers that pay for your service and information that unfortunately you are unable to provide. Celebrity is a big and professional cruise line and should prepare their material professionally offering their customers the best knowledge and services. Due to the lack of knowledge and information from the excursion desk, we were forced to gather information using your Excursion Information Channel, unfortunately that too was as un-informative as your staff. As a result, we were unable to book the tour we wanted (ML43) in time, therefore force to settle with ML33. If we didn’t bring our own internet printout excursion descriptions, we would have never been able to figure out any tours, because your office has no written descriptions of any of the tours available and your staff was not able to answer any questions. We are very disappointed and feel misled. We feel that we did not receive what we paid for in the ML33 excursion and a portion of the tour fee should be refunded, at the minimum. We should not be spending this much time to write the comment/complaint letter as we should be enjoying our cruise. But as Damian, the cruise director, says “Please do write them so Celebrity can improve in order to stay on top of your industry.” We hope this help you understand our perspective as customers and how much we feel your ship is disorganized in many aspects. We’ve cruised on other competitive ships as well and feel like you are the worst. We did not experience the high comments that people say about Celebrity. I find that some drivers, usually in a one lane road, tend to take the middle and do not signal. Are you going straight? Right? Left? Meanwhile, there is a line of cars behind you waiting on you for your next move. Remember to signal to let others in on your big secret. Here is an idea that may be helpful. If you are going to make a left turn...stay to the left. And, and...get this, if you are going to make a right turn...you guessed it, stay to the right. Remember to signal to let others in on your big secret. Just because you are Asian, does not mean you have to drive like one. And if you are not Asian...you have no excuse.